Some 3,600 people died in the Troubles. Many thousands more were maimed, injured and bereaved. Yet the circumstances of the murder of Jean McConville can still leave a cold feeling in the pit of one’s stomach. She was a 37-year-old woman, a Protestant widow who had been married to a Catholic, and was the mother of 10 children who were left orphaned and desolate. The campaign to recover her body, which was finally found on Shelling Hill beach in Co Louth in 2003, led to the creation of a North-South commission to locate the bodies of 17 people known to have been “disappeared”. So far 10 bodies have been recovered. 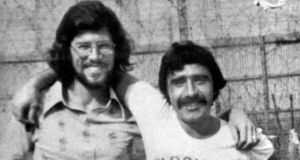 The so-called “Boston tapes”, potentially, are why Gerry Adams is being questioned for involvement in the December 1972 abduction, interrogation, murder and secret burial of McConville. The Boston College oral history of the Troubles project was the brainchild of journalist and writer Ed Moloney and involved the interviewing of former republican and loyalist paramilitaries based on guarantees their testimonies would not be released until after their deaths. The early deaths of former senior IRA figure Brendan “the Dark” Hughes and former Progressive Unionist Party leader and ex-UVF man David Ervine, both of whom participated in the project, allowed Moloney publish a book, Voices From the Grave, four years ago. The book recorded Hughes’s account of how McConville was first lifted by the IRA, allegedly for working as an informer by having a British army transmitter in her flat. Hughes said she was “let go with a warning” but when another transmitter allegedly was put in her house she was abducted by an IRA gang. “There was only one man who gave the order for that woman to be executed. That . . . man is now the head of Sinn Féin,” said Hughes. As this is posthumous evidence there is a heavy question mark over whether it can have much – or any – legal evidential value. The McConville family and former Northern Ireland police ombudsman Nuala O’Loan rejected the informer allegation against McConville. Regardless, in his account Hughes said Adams and a senior IRA commander agreed that she should be “executed” but argued over whether her body should be left on the street in west Belfast as a warning to potential informers – as regularly happened – or secretly buried. Hughes said that Adams won the day, and it was decided she should be secretly buried. “I think the reason why she [was] disappeared was because she was a woman,” Hughes said. Adams emphatically denied the allegations, and made the point that Hughes, his former friend and an IRA member, was antagonistic both to him and to how the IRA and Sinn Féin had managed the peace process. But then Old Bailey bomber, the late Dolours Price, who also gave evidence to the Boston College project, made similar allegations, which Adams again denied. He also pointed out that she was also antagonistic to him and the peace process. The result was a huge controversy over the PSNI seeking access to the Boston tapes, which could have proved of evidential value to the police investigation, certainly while Price was alive. The police pursuit of the tapes caused consternation because handing them over would mean that the pledge given to participants of anonymity and non-disclosure ahead of their deaths would not be honoured. It also triggered a quarrel between, on one side Moloney and his chief researcher Anthony McIntyre, a historian and former IRA prisoner; and on the other side Boston College over how to resist the legal challenge from the police. They accused the college of weakness. The upshot was that the PSNI won the legal battle and tapes of Hughes, Price and about half a dozen others were handed over to the police. All these tapes, it was stated in the legal proceedings, had content relating to the McConville murder. In recent weeks a number of people have been arrested in connection with the murder. Some of them were released pending reports being sent to the Public Prosecution Service, which leaves open the possibility that prosecutions could follow. In March, Ivor Bell, now aged 77, was charged with aiding and abetting the murder of McConville. It was this charging that prompted Adams to offer to voluntarily present himself to the PSNI if it wished to ask him questions. Police sources in the North, along with Taoiseach Enda Kenny, First Minister Peter Robinson and British prime minister David Cameron, have rejected a Sinn Féin allegation of “political policing” in the questioning of Adams. “The case is driven by investigative necessity,” said one police source. In the meantime, the McConville family wait and watch to find out if they are any closer to achieving justice for their mother. This page was loaded Apr 23rd 2019, 10:15 pm GMT.